Complete Ireland Experience – The Great Canadian Travel Co.
Ireland has more myths and legends than you’d dare to believe. It has more gorgeous coastlines and majestic mountains than your camera could capture. And there’s enough lively bars to satisfy even the most dedicated of party goers. Departing Dublin, you head north to the border of Northern Ireland. A short journey from the divide lies Belfast, a city famed for its industrial heritage and turbulent past. A historical feast, you take a short city tour which covers the capital’s triumphs, tragedies and soul. Discover the Titanic Quarter, a regenerated hub where the famous liner was built and launched in 1911. Exiting its excellent museums and attractions by the afternoon, you can choose to board the SS Nomadic, the final surviving White Star Line steamship or explore the fascinating Titanic Dock and Pump house. Leaving bustling Belfast behind, you move through the phenomenal scenery of the Antrim Coast and Glens, an official Area of Outstanding Natural Beauty. Moving along the winding roads of Ballycastle, you enter the awe inspiring setting of the Giant’s Causeway, where history and myth collide spectacularly with raw geological power. Waving farewell to the giant’s steps, you head to Portrush, a charming fishing village that will be your home for the night. Westport – Sweep past Atlantic views and across verdant soil around this pretty bay front village. Cong – This scenic town in the heart of Connemara has the beauty of its ancient abbey, as well as more modern strains of culture within the “Quiet Man” Museum. Cliffs of Moher – Behold an awe-inspiring 700ft drop to the crashing waves of the Atlantic Ocean. 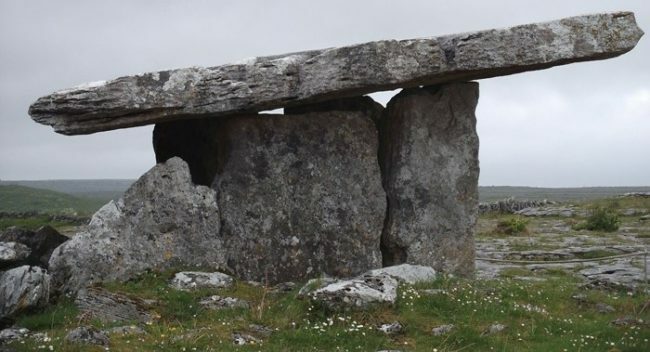 The Burren – A true treasure of Ireland: beautiful and mysterious in equal measure. This national park is home to some of the nation’s most profound spiritual and natural culture. Ring of Kerry – Travel over 100 miles of beauty and intrigue, with something for all the senses along this classic tour route. Torc Waterfall – Learn of the ancient curse that formed this waterfall and its inimitable cascade. This tour is a combination tour consisting of three shorter tours: Northern Ireland and the Atlantic Coast; Escape to the West; Kilkenny, West Cork and Kinsale. You will have a different driver/guide for each segment of the trip. These tours are basic and a bit more casual than many of the large-coach tours. They offer you the opportunity to only visit the attractions you are interested in and to have some free time in the evenings. You can decide whether you want to go out for dinner to a cafe or restaurant of your choosing with the group or on your own; buy some food at a supermarket or local take-out and eat at your accommodation; or hang out with other people from your tour. The choice is yours! Galway lies on the edge of Connemara, the area you are exploring today. 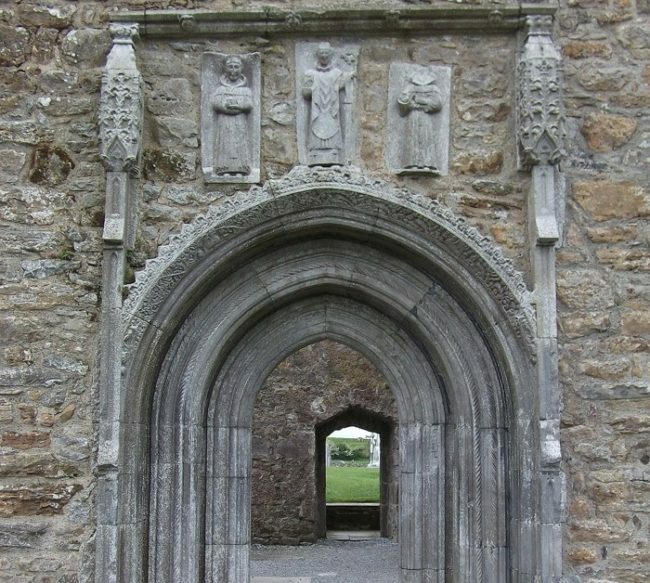 Alternatively, you can visit the magnificently restored 12th century Cong Abbey. From here, you continue through the heart of Connemara for a visit to the beautiful house and grounds at Kylemore Abbey, where the grand structures and magnificent man-made gardens are a treat for the eye and soul. Your journey then continues to Connemara National Park, where abundant wildlife resides amongst the ancient tombs and intimate woodland paths. You will view the truly magnificent Diamond Hill, a 500m peak that rivals any summit in Europe, and then on to Clifden, famous home of the first transatlantic flight landing. Here you enjoy the unbroken and infinite majesty of the Sky Road, as well as the sharp peaks of the Twelve Bens of Connemara. This distinctive mountain range offers an excellent photo opportunity, before you head down and back for the night to your cosy residence in Westport. 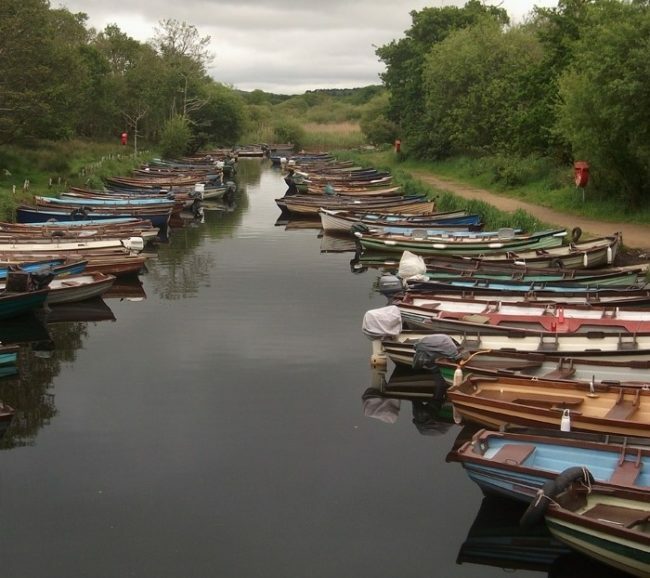 Travelling inland through the Maam Valley to the village of Cong, you come upon the shore of Lough Corrib. Famously the setting for the film classic “The Quiet man”, you are free to tread the halls of the excellent local museum devoted to the movie. You will be dropped off at your accommodation in Galway before the first tour returns to Dublin. The afternoon and evening are free to explore this lively university city. You will be collected from your accommodation the following morning by your new tour driver-guide. The tour navigates the fabulous Dingle Peninsula today, the scenic heartland of Gaelic culture and tradition. Your first stop is Inch Beach, a vast expanse of sand stretching out into the Atlantic that’s popular with extreme sports fans. Venturing down the narrow roads away from the beach leads you through the town of Dingle, popular for its dolphin tours. You pass on towards Slea Head, a promontory loaded with ancient forts and millennia-old dwellings. Captivating views of the nearby Blasket Islands rising dramatically from the sea make this an excellent space for photos. If the weather stays pleasant, you can ramble along the beaches and cliff tops to fully appreciate the incredible vistas. A landscape steeped in Gaelic literature, you have the chance to learn about its influence on Irish literary culture. Arriving back amidst the brightly coloured houses and jolly harbour of Dingle, you spend the remainder of the afternoon enjoying delicious seafood in this idyllic setting. In the evening, you head back to Killarney, with time for an evening stroll in the National Park that borders the town. 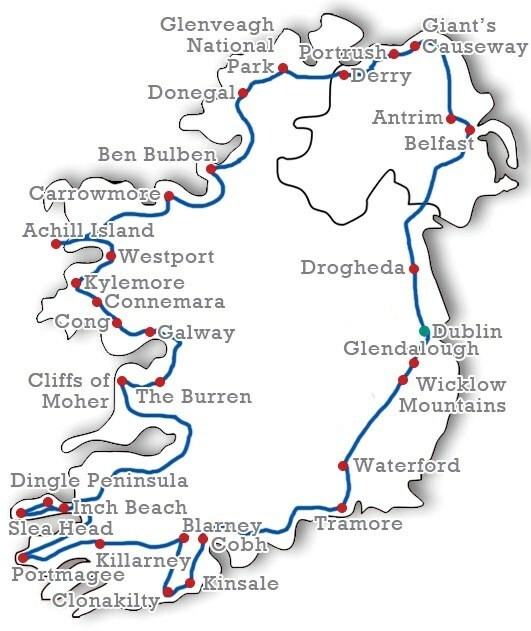 Today you tour the Ring of Kerry, a spectacular route through some of Ireland’s most historically and visually incredible areas. You head out in the morning for over 100 miles of unbeatable scenery, stopping first at Ireland’s highest mountain Carrauntoohil. After snapping some shots of its imposing size, you join the scenic coast road through Glenbeigh and Kells on the way to Cahersiveen. Possible stops include the site of “The Liberator of Ireland” Daniel O’Connell’s birthplace and an impressive ring fort outside Portmagee, your stop for lunch. This quaint fishing village offers a chance to relax whilst indulging in the local seafood. 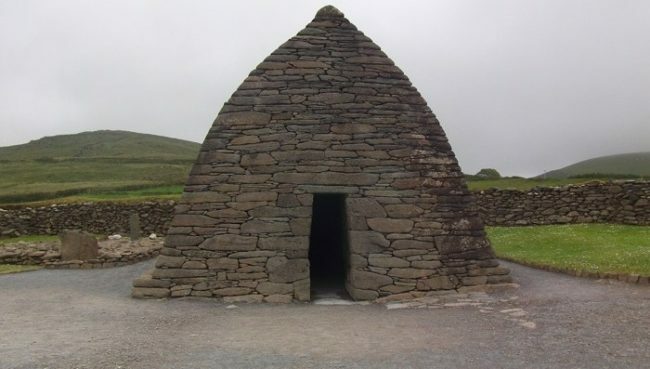 Alternatively, you can head to the island of Valentia for a visit to the Skelling Experience, where you learn about the ancient community of monks who made the outcrop of rocky islands their home. In the afternoon, there’s a photo stop in Charlie Chaplin’s favourite holiday “home away from home” of Waterville before a trip to the very top of Coonmakista pass and the divine views it offers. Winding down from the peaks, you head to sea level on the way to Derrynane House, home of the family O’Driscoll, whose most famous son Daniel O’Driscoll holds a special place in Irish hearts as an emancipating force from colonial rule. Stroll in the scenic gardens here, as well as exploring the main house where so much Irish history was forged. Continuing along the Ring, you stop at Moll’s Gap and the Ladies View, offering two stunning sights perfect for memorable pictures. Stroll a short way to the Torc Waterfall before heading back to Killarney. (On some tours, Days 7 and 8 are switched). 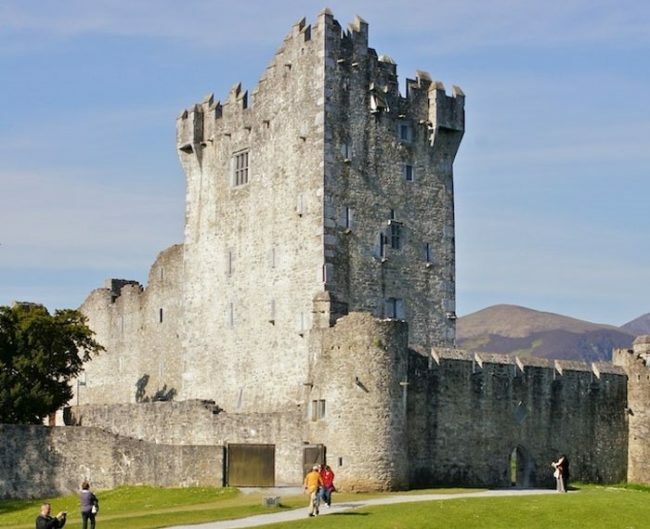 Heading east through the mountains of West Cork, you weave along the Lee Valley until you reach Blarney Castle, the impressive medieval fortress that lies on the outskirts of Cork. You have time to take in the castle grounds and wander its woodland trails. Visiting the nearby village, you may even get the chance to kiss the famous Blarney Stone and receive the “gift of the gab”! In the afternoon, you change driver-guide and pass along the beautiful coastline south of Cork before arriving in Kinsale. This charming little fishing village is your overnight stop, so you can take in the delights of the “gourmet capital of Ireland”, with its first rate local restaurants and lively pubs. Savour your free evening whilst exploring the narrow streets and brightly coloured houses around your accommodation. Leaving Kinsale in the morning, you make your way to the historic port town of Cobh. The major departure point for Irish emigration for the 19th and 20th centuries, this was the last port of call for the Titanic on its infamous maiden voyage. After unearthing the stories from Ireland’s past, you head east along the Copper Coast, a Unesco Geopark famed for its beauty and intricate histories. You continue until you reach Waterford, Ireland’s oldest city, founded by Vikings in the 9th century. Survey the wondrous craftsmanship at the Waterford Crystal factory, explore the selection of fine museums or wander the ‘Viking Triangle’ on foot. In the late afternoon, you travel north away from Waterford and over to Kilkenny, a vibrant city with an impressive castle and parklands where you stay for the evening. WIth riverside trails, the National Craft Centre and a thriving pub and restaurant culture, you are certain to see why it was voted Ireland’s friendliest city!